So, Valentine’s Day is coming up and every year my kids like to give chocolate to their lovely teacher. Since my daughter takes the bus to school, we always include our wonderful bus driver in this tradition. Can you believe my six year old is outside to catch the bus at 6:20 a.m. and the bus driver always has a big smile to greet her? Honestly, I feel really lucky that we have such great folks taking care of my children . I’m hope that you feel the same way and I’m happy to share with you the printables that I designed. Both PDF files are available for free download from Scribd.com. Click here for the teacher one and here for the bus driver one. ****UPDATE: I’ve just found out that Scibd has changed their policies and is now trying to get people to sign up and PAY FOR monthly subscriptions. There is an option for a free subscription but it’s not very clear at all. It is, in my opinion, totally CRAZY that they are making a profit on items that are intended for FREE distribution. So, I’m putting the files at the end of this blog post. If you have issues, please e-mail me and I’ll e-mail these to you with pleasure. Thanks!!!! 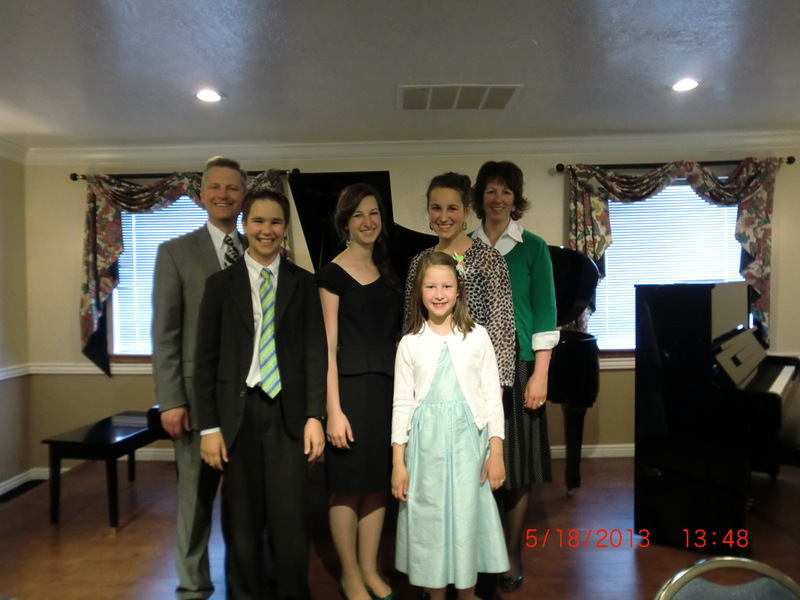 Today I am happy to share photos from the Blonquist Family Music Recital. When mom, Yvonne, originally contacted me the only recital printables I had in the store were geared towards young children. Think pink, green and yellow polka dots and big bold musical notes. She wanted to know if I could adapt the printables to make them more elegant and also gender neutral. Of course, I am always up for a challenge and I was also very impressed that all four of Yvonne’s children would be taking part in the recital so I jumped at the opportunity. At first I suggested going with Kelly green and a pale blue and use a damask print. I love contrasts and the idea of mixing a bold green with a cool blue appealed to me but as I was working on the invites, the two colors just didn’t look right together. I wasn’t getting the elegant and modern look I was after. So, I reworked the color combination to Kelly Green and a classic Navy Blue. Wow! What a difference. If you’ve been following me for a while, you’ll know that I also love mixing patterns, too. So, I went ahead and included some striped belly bands for these damask print invites. 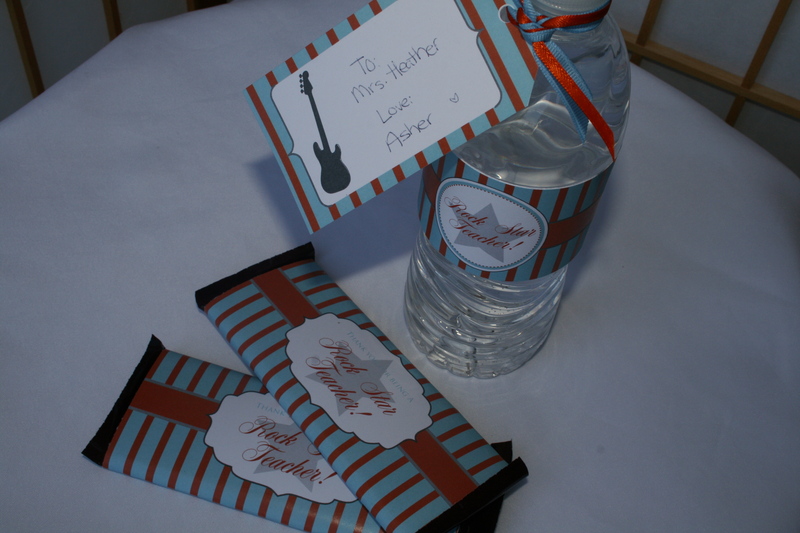 Believe me, stripes and damask look fabulous together and I then incorporated the stripes to the Hershey kiss labels. I think the overall effect was a good combination or sophisticated yet fun. The damask print ensured that the girls would also like this design. Perfect for this very talented family. 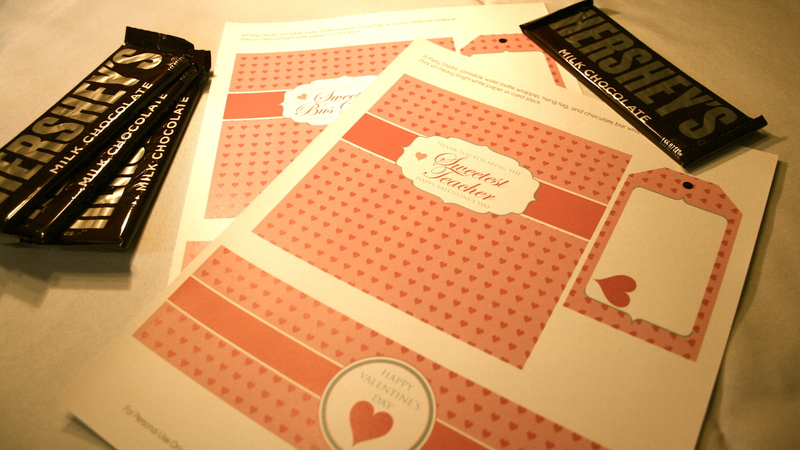 Here is the invite and the Hershey Kiss labels. My husband and I both studied music in college and have done an annual family recital since my oldest was 5 years old, so about 14 years. 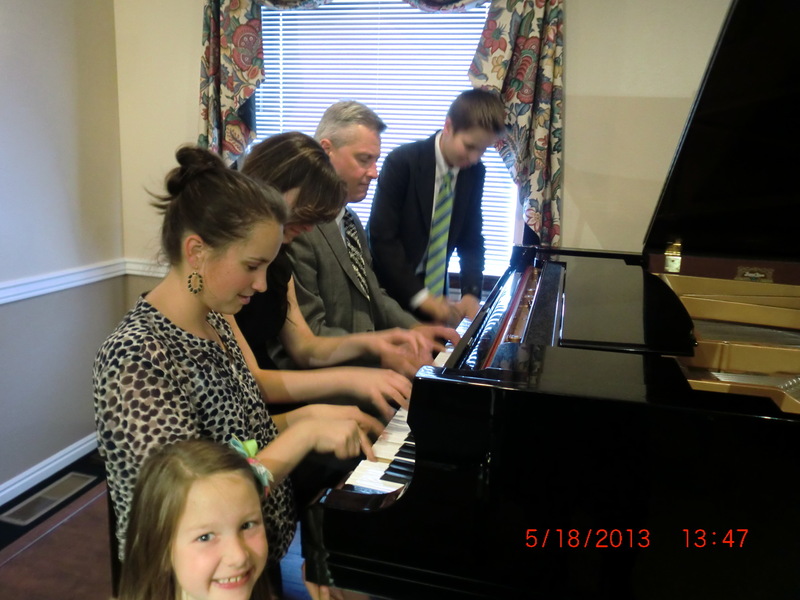 We now have 4 children, ranging from ages 10 to 19, all who play multiple instruments and sing. We all perform each year, including my husband and myself. 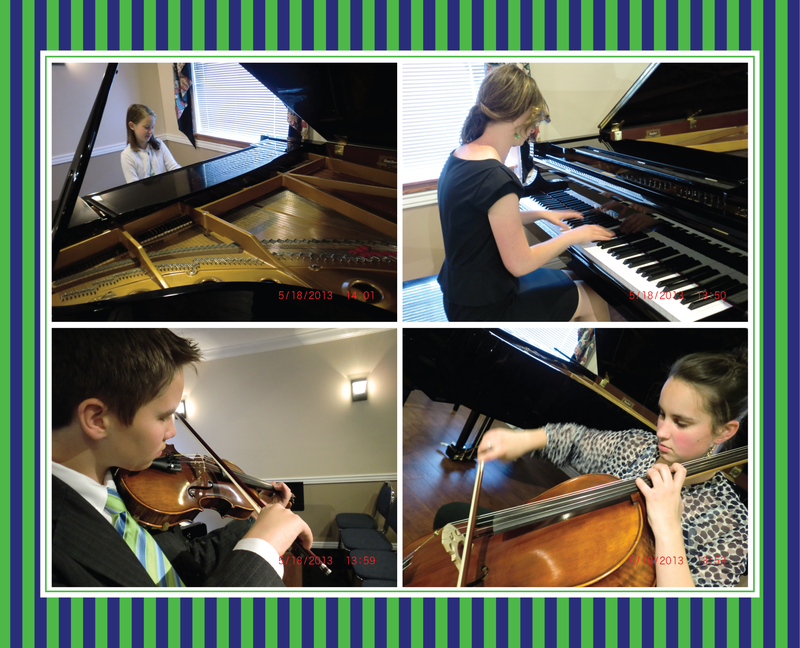 We invite friends, family and their teachers from our Music Academy as well as from their regular schools. It requires a lot of preparation, but it gives our family a chance to celebrate what we have accomplished over the year. Sometimes the kids complain about it, but just tonight at dinner my 16 year old said “You know, I really loved performing with my family yesterday. It was fun to do that together. 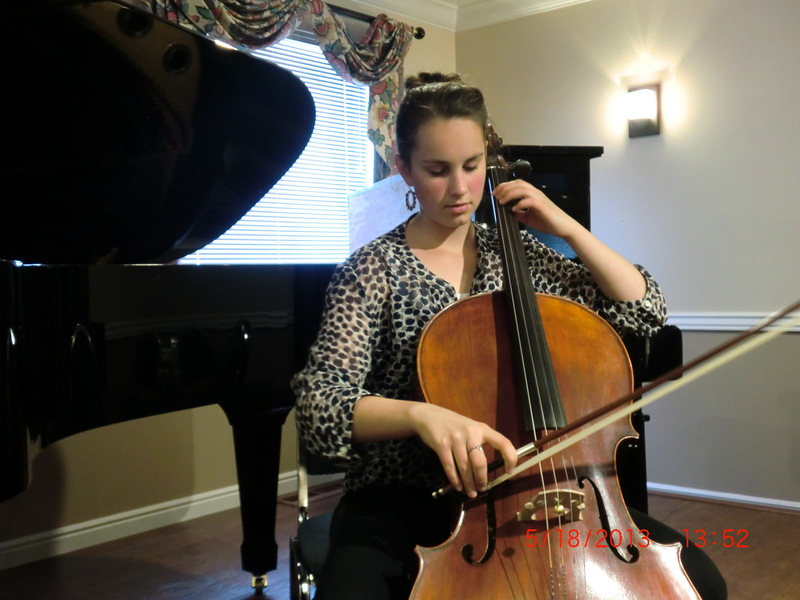 I think it is a great tradition, and I hope we continue to have family recitals each year.” That really meant a lot to me because I am the one that manages all the details (dates, invitations, programming, refreshments, etc.) and sometimes I feel like I am pulling everyone along! This year I heard about Etsy from a friend and after looking at many vendor’s and even emailing a few, I settled on Tali. She was great. It was so nice to have someone with a great eye help to pull together some of the details. I am a little crazy about everything going together! I loved the navy and kelly green colors she chose for the invitations and the kisses. 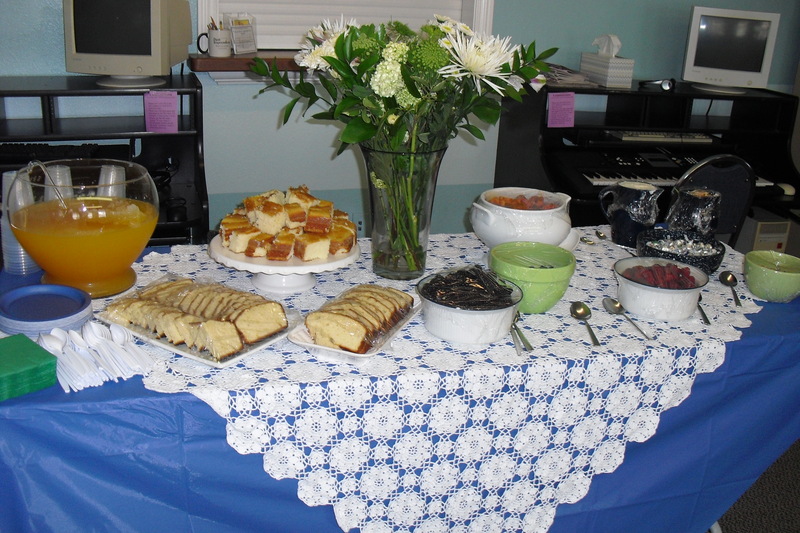 I worked off of those for our programs, flowers, refreshments and even to an extent what we wore. We were well received and it made for a memorable day for all of us. 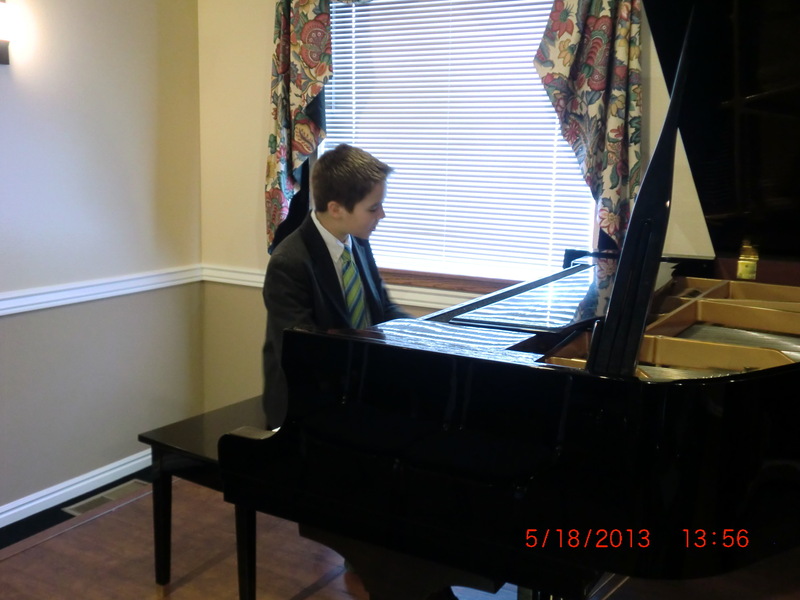 Thank you so much Yvonne for sharing photos from your family’s music recital. 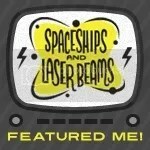 Please follow me on Facebook, Twitter or Pinterest. 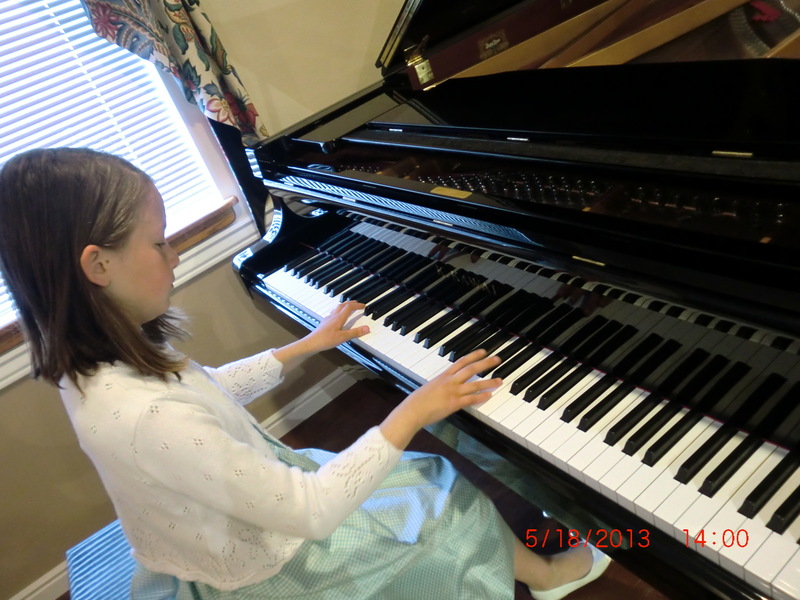 If you are planning a music recital or a music themed party, please check out my board on Pinterest for more ideas. 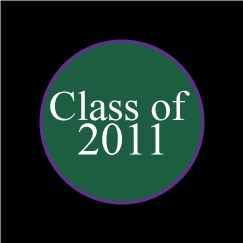 Recently a client asked me to design Class of 2013 Graduation Hershey Kiss Stickers. These match the water bottle wrappers and hang tags in my Etsy store. I thought they came out great and wanted to share them with you. So, here you go… simply click on the picture below to be taken to Scribd.com where you can download the file for FREE! The sophisticated damask print and light blue color makes these perfect for any graduate. The circles are ready to punch and stick to your sweets. Print as many as you like! The circles measure .80″ and are designed to be cut out using a 3/4″ (.75″) circle punch. The punch can be found at Michaels, Hobby Lobby, or your local craft or scrapbooking store. I recommend printing these on 110 lb bright white paper and then use a little glue to stick them on the kisses (a glue stick is perfect). For instant stickers, purchase blank sheets of sticker paper found at office & craft supply stores. If you don’t want to buy a whole packet of sticker paper, you can get these printed at Office Depot or Staples and request to have them print on sticker paper. Congratulations to all the Class of 2013 graduates! If you are looking for personalized graduation printables, then I have a decent selection in my store and you can choose your school colors. 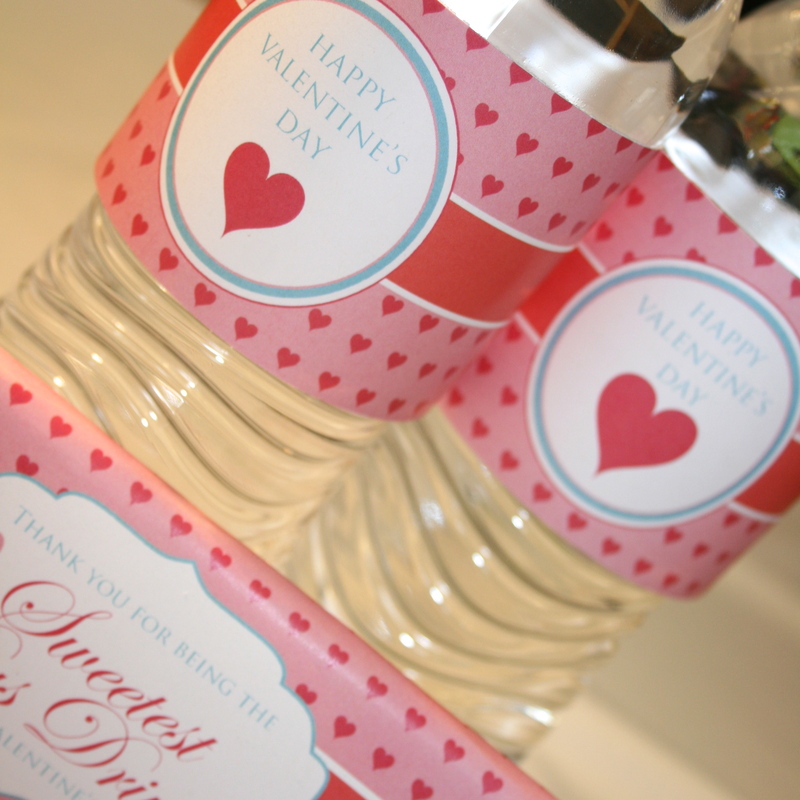 You can check out the hang tags, cupcake toppers, chocolate bar wrappers and water bottle wrappers here in my store. 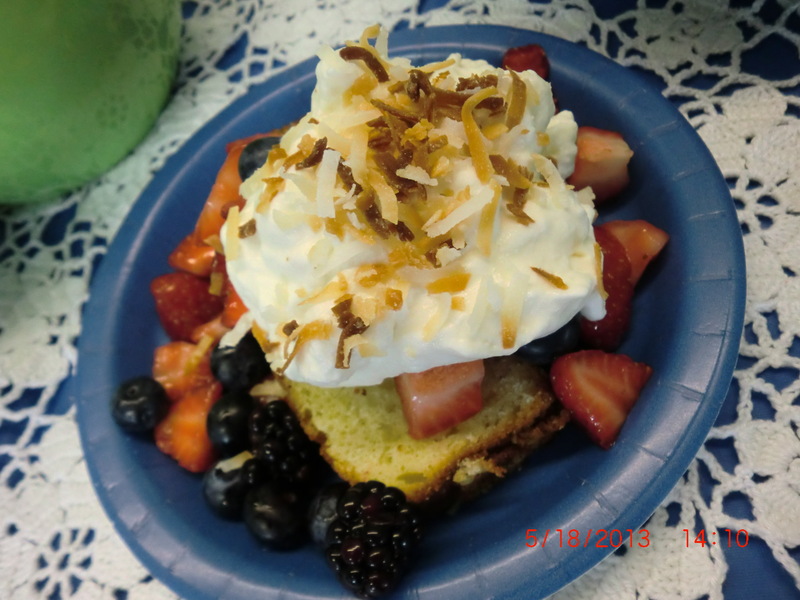 Please follow me on Facebook, Twitter or Pinterest. If you have any questions, just leave a comment on this blog post and I’ll get back to you as soon as possible. Thanks. I was contacted by Jessica to create cupcake toppers and other party supplies for her sister’s high school graduation. Jenni’s church is having a graduation party for all the seniors. Each senior gets their own table and has to bring snacks and decorate it however they would like. How lovely is that idea? Here are the cupcake toppers that I’ll be offering in the store. I have purposely used Times New Roman font! The old stand-by font we all grew up with. The request for personalized cupcake toppers got me thinking about other party supplies that would make a big impact when decorating a table. I love water bottle wrappers. They make a big impact with not much effort! 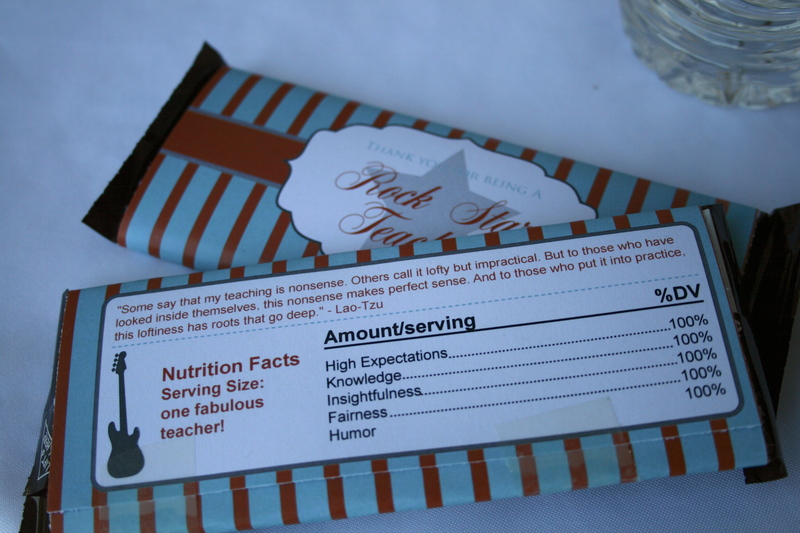 And if you’ve been following my blog for a while, you know that I am obsessed with personalized chocolate bar wrappers that double up as keepsakes. I make them every year for my kid’s birthdays and keep the wrapper. I also send the personalized chocolate bars to family that couldn’t be at the party. 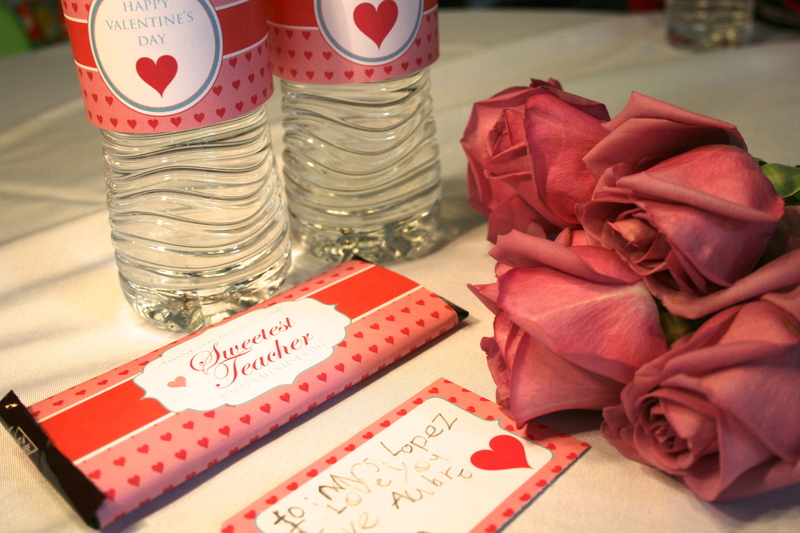 So, of course, I had to make Jenni some chocolate bar wrappers that she could use as table favors. Don’t these look great? The wrappers are personalized with the school name, the school’s team (in Jenni’s case- the Panthers), and the name of the graduate. Of course, the wrappers feature the school colors! Know someone who is graduating? Need some unique and fun party decorations? 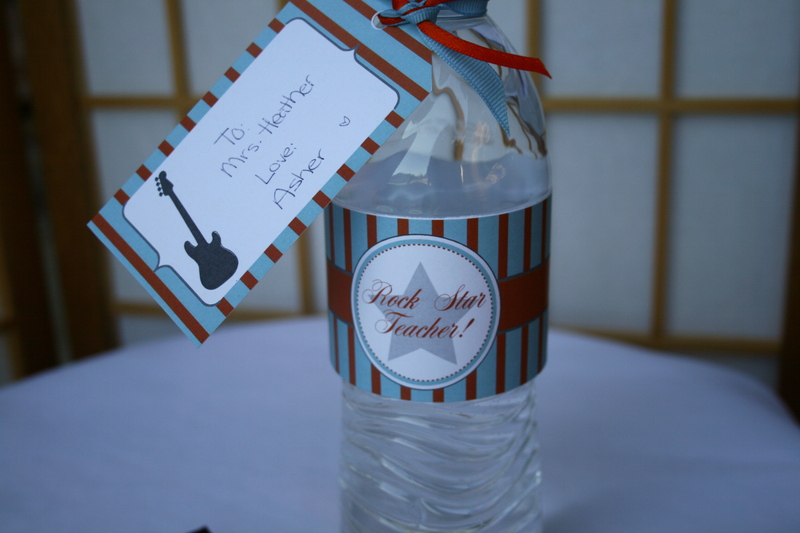 I can customize the cupcake toppers, the water bottle wrappers and the chocolate bars to meet your school colors! Jennis’ school colors are dark green and black; however, she wanted a splash of purple so that the party supplies reflect her personal tastes! Here is a color chart of standard school colors however, I can of course use other shades. Check out my Etsy store for these and other fun printable!